they would have quite possibly failed in achieving in two days what General Pershing wanted in one." 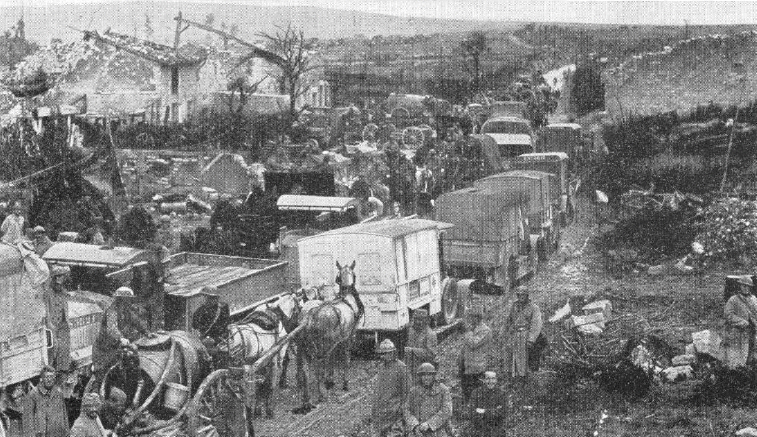 All supplies and evacuations of the German armies in Northern France were dependent upon two great railway systems- one in the north, passing through Liege, while the other in the south, with lines coming from Luxemburg, Thionville, and Metz, had as it.s vital section the line Carignan- Sedan- Mezieres. No other important lines were available to the enemy, as the mountainous masses of the Ardennes made the construction of east and west lines through the region impracticable. 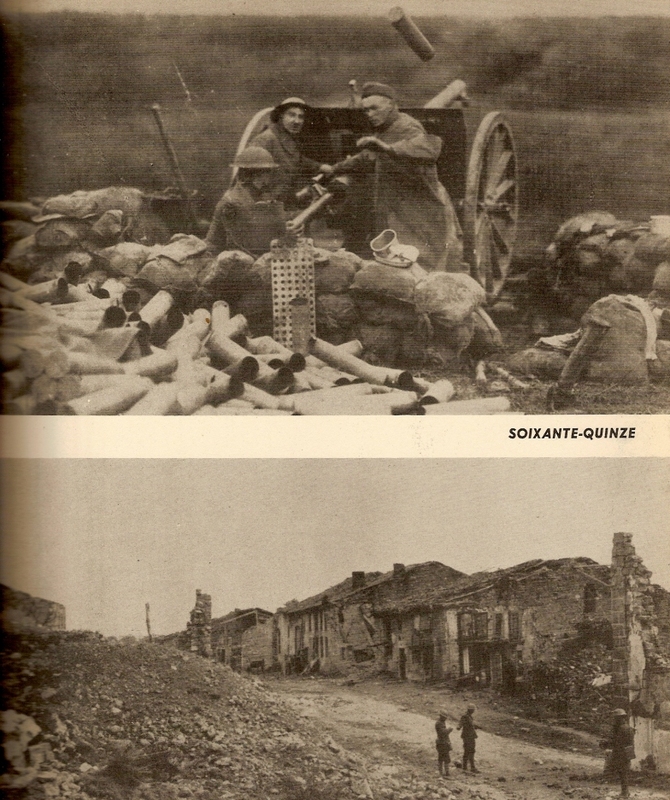 The Carignan- Sedan- Mezieres line was essential to the Germans for the rapid strategical movement of troops. Should this southern system be cut by the Allies before the enemy could withdraw his forces through the narrow neck between Mezieres and the Dutch frontier, the ruin of his armies in France and Belgium would be complete. Four great army groups- American, Belgian, British, and French would engage the enemy line from Flanders to the Meuse, in an attack known as the Meuse-Argonne Offensive. This offensive would last almost two months and determine the final outcome of World War One. Combined, simultaneous, American, British, French, and Belgian attacks were to prevent German reinforcements from defending railroads and force a German withdrawal from the Hindenburg line. 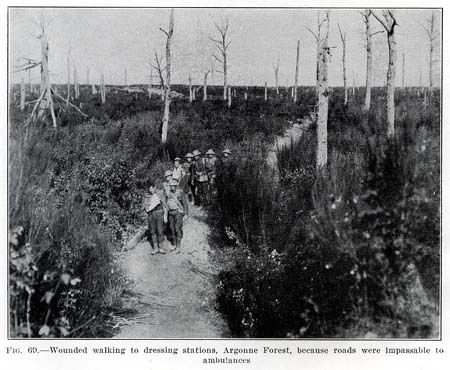 The American First Army, positioned east of the Argonne forest, was to drive straight north toward Sedan and Mezieres. Nine American divisions entered the line by the night of September 25th, 1918. From east to west, they were the 33rd, 80th, 4th, 79th, 37th, 91st, 35th, 28th, and 77th. Almost in the center of this line and the object of the 79th Division.s attention, lay the German Army stronghold and observation post used by the German Crown Prince during attacks on Verdun in 1916- the town of Montfaucon. 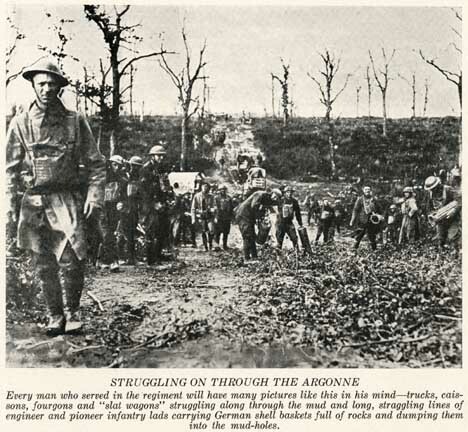 Click here to read "US Army V Corps Meuse-Argonne Operation September 21, 1918 to November 11, 1918"
The morning of September 25th, 1918 found the 79th Division resting in billets and glad of it. Rain had started to fall and would continue for most of the day causing a muddy, slippery mess. The day passed quietly until about 6 P.M. when regimental and battalion commanders were called to division headquarters. They arrived to find General Pershing and division commander General Joseph Kuhn waiting. Pershing.s visit was to inform the officers that they would be attacking Montfaucon in the morning. The 79th was expected to advance and take the town, at a depth of four miles, in one day. 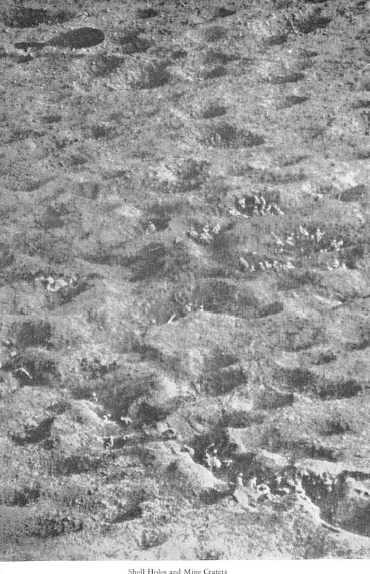 A total depth of nine miles, one and a half miles wide, was to be completed by the end of the fifth day of attack. The 4th division would be on the right and the 37th division on the left. Pershing knew the 79th was .green. but expressed his full confidence in their achieving the objective and stated the artillery would open the way for them. The 313th and 314th infantry would lead the attack with the 316th and 315th infantry in support respectively. As the news raced through the regiments, the men knew they were being asked to participate in one of the worlds greatest military events. "Armageddon" was about to be unleashed. Orders went out for each man to carry two rations, light equipment, and fall in. At approximately 7 P.M. a pale moon was visible as the 314th moved in darkness toward the second line trenches. The roads became almost impassable during the night due to all the men and equipment trying to get in position. Any movement during daylight would have alerted the Germans to what was about to happen. 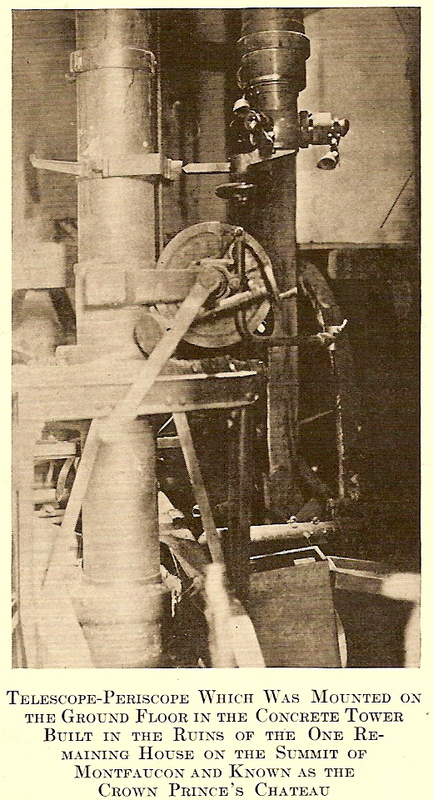 At 11:30 P.M.. preliminary heavy artillery opened fire. Incredibly, the men reached their positions without alerting the Germans of their movements. By 2 A.M. elements of the 129th Infantry were being relieved from outpost positions. The 313th was on the left and the 314th on the right. Scouts went out to find and mark the way to sixteen points in the German barbed wire that would need to be cut. At 2:30 A.M. Thursday morning, September 26th, along the entire twenty mile American front, 2,700 artillery guns opened up with a deafening roar that was to be recorded as the largest concentration of artillery fire in World War One. As troops of the 79th division moved past the guns, smoke enveloped them and at times their uniforms would ripple from the muzzle blast. The noise was so bad that men would have to put their mouth next to the ear of a comrade to be heard. The muzzle flashes, so bright and constant, a newspaper could be read. A veritable curtain of shells shrieked over the trenches carrying death to every point in the German lines for a depth of five kilometers and more. It was by 4:30 A.M., that the 313th and 314th reported themselves "all set". The artillery fire never ceased and at 5:30 A.M. turned its concentration on the enemy front line and the inexperienced, untried infantry went "over the top". The time of 5:30 A.M. will be forever remembered as the 314th jumped off into a foggy morning attack. Twenty seconds prior to this, trench mortars of Company D First Gas Regiment provided a smoke screen while artillery pounded the German front lines for twenty five minutes. The wire cutters had done a poor job in the early morning. Both the 314th and 313th lost time as more barbed wire was cut away. Fortunately during this time German artillery was falling behind the advance. Once through the wire, the regiments easily took what was left of the German first line, the U.S. artillery having destroyed it. However, the ground ahead was filled with almost four years of war. Shell holes, destroyed trenches, tangles of barbed wire, remnants of woods and rubble of what were once houses and farms. A rolling artillery barrage was to be 200 meters in front of the troops as they progressed. 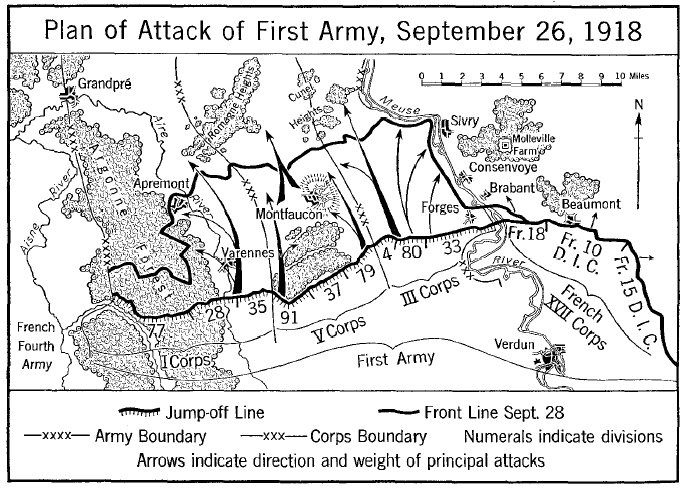 U.S. High Command expected difficulty with the terrain and allowed one extra minute for every 100 yards of advance. This was not enough as the men struggled and the rolling barrage was soon gone for good, far in front. The fog and smoke screen helped to confuse matters and subsequently, German machine gun nests and snipers were overrun and in the rear of the advance companies. To compound the problem, elements of the 315th and 316th support regiments would catch up and intermingle with the advance groups. Both the 314th and 313th had advanced down a slope and over marshland to a woods -- the Bois de Beuge. The 314th entered the eastern part of the woods, lead company F rushing through, only for M company behind, to encounter Germans who were emerging from shelter. M company "mopped up" the opposition, but only after severe causalities. At approximately 7:30 A.M. the 314th emerged from the woods, into a heavy concentration of machine gun fire, and the town of Malancourt. To the west, the 313th had passed through the woods and entered an open field also encountering machine gun fire from the woods beyond. 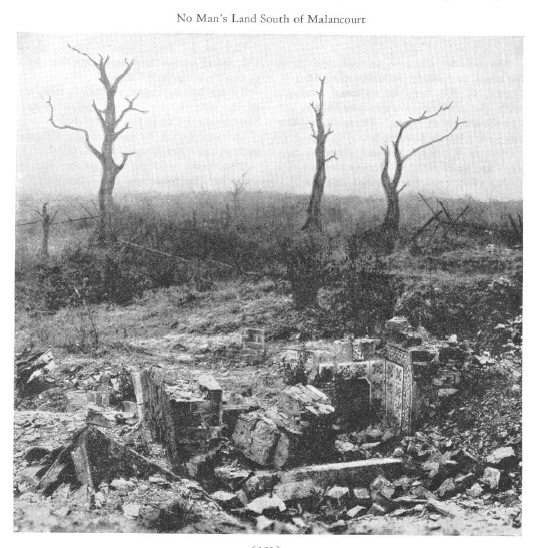 Malancourt existed not as a town, but a pile of rubble and shell holes that had exchanged French and German hands six times since 1914, with the Germans occupying it since 1916. 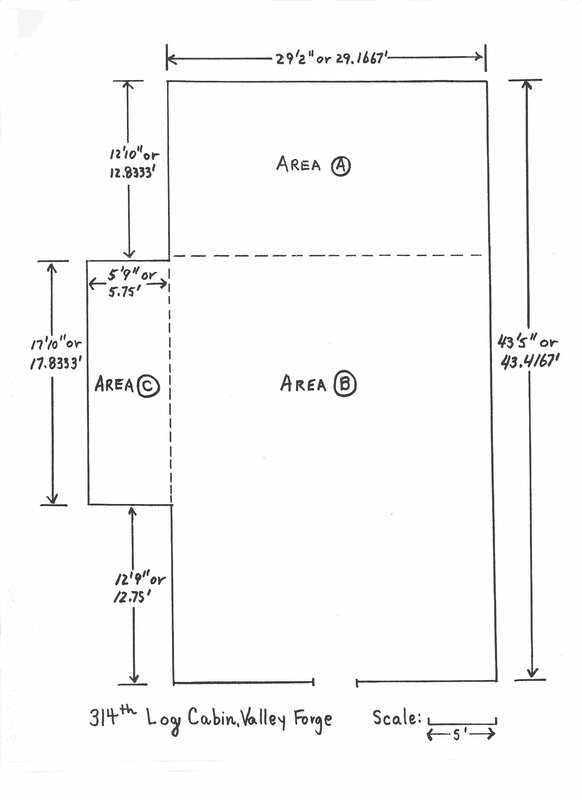 In this area, the enemy was heavily fortified with numerous machine guns and the men of the 314th would have to work almost independently with rifle fire and grenades to clear the enemy nests. During this time, German artillery and snipers were also finding their mark. The attack crawled to a snails pace, foot by foot, in a series of bitter struggles. 314th Companies C to M including the HQ and MG companies were all heavily involved. 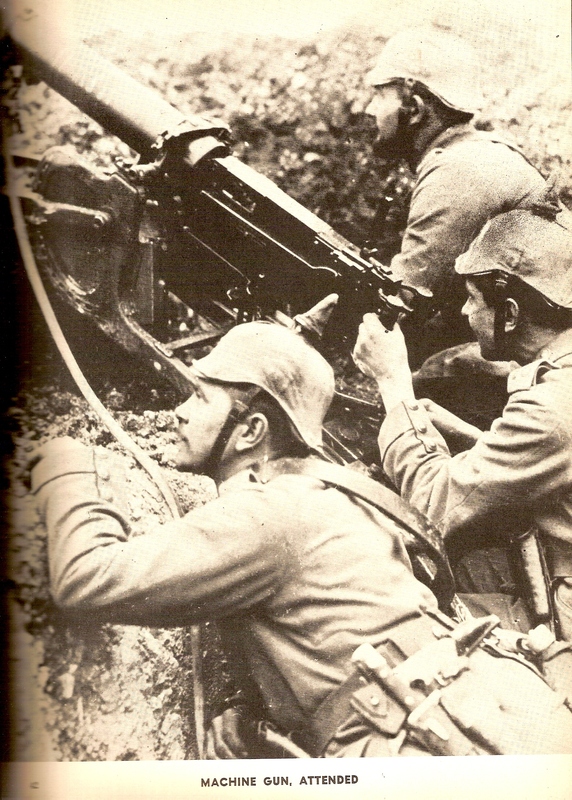 The 79th Division History notes, as an example, Company K was "up to its neck in combat with machine guns". In the afternoon, Colonel Oury, commander of the 314th, received word from 79th division commander, General Kuhn, to "push the attack more vigorously". By 6 P.M. the 314th had silenced the Malancourt area and spent the next hour reorganizing. By 8:30 P.M. the regiment had dug in for the night approximately one kilometer north of Malancourt. The town of Montfaucon could be seen on the left. The 313th had suffered under similar conditions, fighting its way through another section of woods to a large plain and the base of the hill before Montfaucon. At 6 P.M., they were ordered to resume the attack and only advanced about 200 yards when overwhelmed with all forms of enemy fire. Elements of the 313th gained the outskirts of Montfaucon, achieving a perilous position. 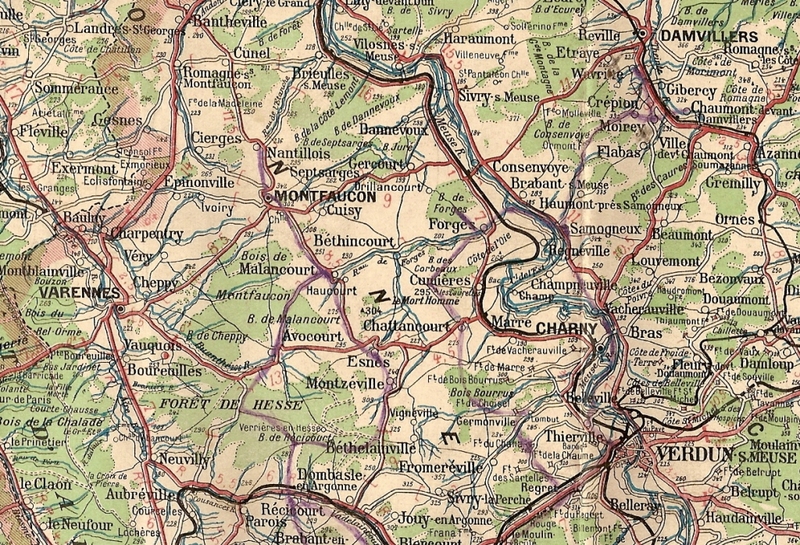 The 313th was ordered back and withdrew to the edge of the woods and dug in at approximately 7 P.M. As a note of interest- at 11 P.M. the German commander of the West Meuse Group issued orders that the town of Montfaucon "must be held at all costs". The day had not been easy for the 314th, fifty two men had been killed in action, more wounded would die in the days to follow, not to mention the untold number of wounded who would survive. Remembering the two rations each man was to carry- many men had used them and water was all but non existent. September 27, 1918- was yet to come. General Pershing was confident of a success. 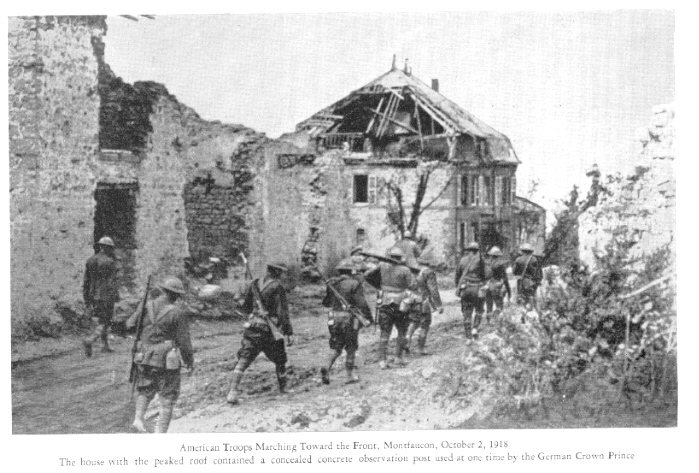 On the morning of September 27, the American public would read of the capture of Montfaucon, while 79th Division troops moved toward the town. 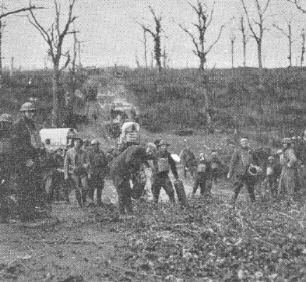 carrying German shell baskets full of rocks and dumping them into the mud-holes. The town of Montfaucon sat on a ridge running east and west. From the height of 1200 feet above sea level the view afforded sight for miles. The 79th Division would be coming up the southern approach which was for the most part a gentle, open slope. The previous day's fog lent itself to rain during the morning of the 27th and would continue for most of the day. Uniforms became wet and heavy; the ground became saturated, and turned to mud. Supporting regiments, 315th and 316th Infantry, had been busy the previous day in "mopping up" enemy positions but remained in support. On the right, the 4th Division had gained considerable ground and was in a line even with Montfaucon. The 37th Division had made similar progress on the left. The result of this being, the enemy would soon be outflanked. However, it remained for the 313th to attack the center of town and the 314th to attack the ridge on the right. Both positions were equally well fortified with hundreds of German machine guns and snipers. During the night, the enemy had managed to bring up another division for support. Road conditions had not greatly improved, although the 304th Engineers were still hard at work fixing shell holes, and laying communication wire on the ground. The wire itself was poor quality, wouldn't work when wet, and was constantly being cut by heavy traffic. Ambulances received priority, ammunition second, artillery, then food. 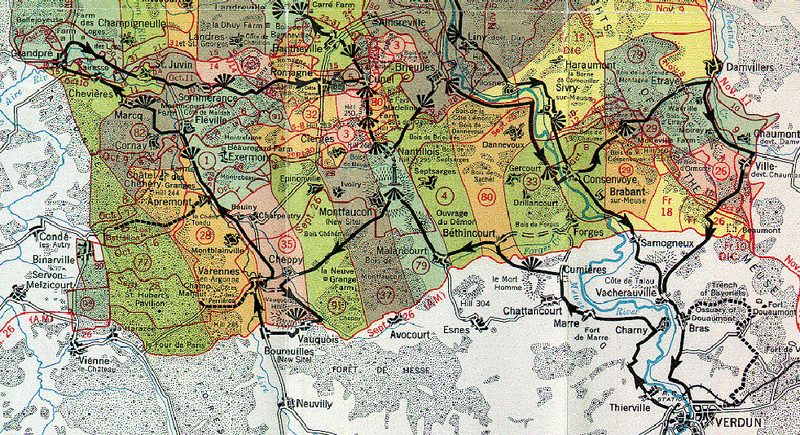 Part of the road system for the 79th Division would be shared with the 4th Division. The ensuing traffic jam and poor access resulted in very little ever reaching the advancing troops. The 314th in particular would advance with no artillery support, food, or water. Various communications from General Pershing and Divisional HQ stated to the effect; "Imperative orders from Commander in Chief require that the 79th Division advance at once to come in line with neighboring divisions". The timing and receipt of communications would be at best; partially adequate. German artillery was ready, to the north of Montfaucon. At approximately 4:00 A. M. the 314th moved in darkness to the attack with Companies I and E in the lead. Enemy machine guns started instantly. Owing to the dark, it fell on support companies to clean up missed positions. By 5:30 A. M. the attack was in full swing for both the 314th and 313th. German artillery cut loose with high explosive and gas shells. The enemy had positioned machine guns so that enfilade and fire from rear nests would cover each other. Under these conditions, it was extremely difficult to flank the enemy. French made and manned tanks would accompany the attack but soon were picked off by the German pre-sighted artillery and abandoned. Bullets ricocheting off the tanks would also take a toll. One thing the 314th did have was a "one pounder" platoon from HQ Company and the 37 mm guns proved of great service, even if for a short period, before being gassed, shelled, and fired upon. The 313th advanced under similar conditions. 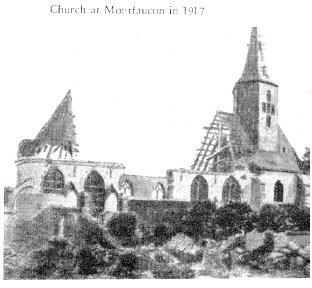 By 11: 55 A. M. - Montfaucon had fallen to the 79th Division. The advance continued north towards the town of Nantillois. Enemy fire had increased to the point that little or no progress was made by evening. The 315th and 316th, in their enthusiasm, had advanced in support so quickly that elements became intermingled with the attack regiments. The 314th had exhausted itself. Colonel Oury ordered the regiment with portions of the 315th to dig in for the night. It would fall on the 315th to take Nantillois on the following day. The 316th would move forward for the 313th. 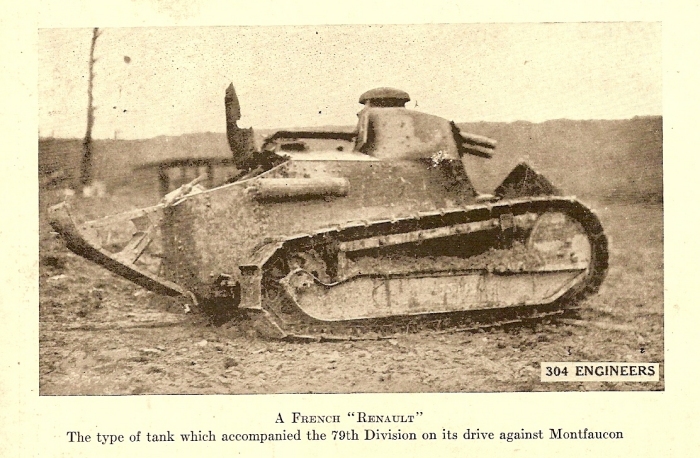 The 79th Division History states; "The Seventy Ninth Division; had been given the deepest first day objective on the entire Meuse-Argonne front". The following days would prove equally challenging for the division. On September 30th, 1918; having suffered heavy casualties, with little food or water, rain soaked, and no rest, the 79th was relieved by the U.S. Third Division. There was, however, one great prize that now belonged to the U. S. Army - the periscope which the German Army had used in its futile attacks on Verdun. Incredibly, on September 27th, deaths for the 314th amounted to nineteen but the number of wounded can never be accounted for. Image Caption: "American Troops Marching Toward the Front, Montfaucon, October 2, 1918. The house (chateau) with the peaked roof contained a concealed concrete observation post used at one time by the German Crown Prince." John Shetler states that this image is embossed on the cover of the 79th Division History book! There can never be sufficient praise for the splendid fighting men in the Liberty Division; their deeds speak for themselves. Only since the days of peace has there been a full realization of the difficulties they faced; of the vicissitudes they encountered; of that living hell through which they passed during the last five days in September and the first eleven of November. 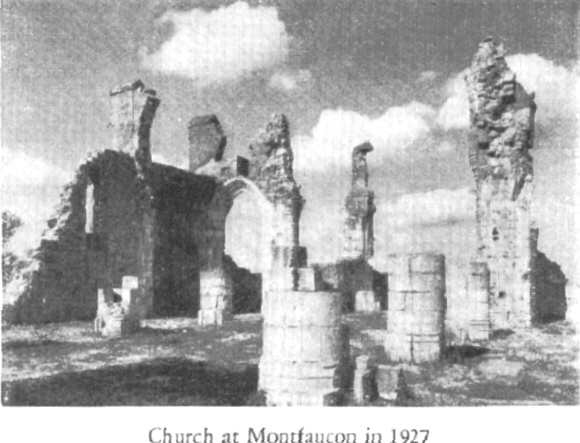 The ruined heights of Montfaucon." And outraged Gods and Creeds." By steel and thermite cleaned- they.ve gone. Me here in this terrible mess. Those guns in the .pill boxes. spit. Stands out from the knee cap, alone. Oh well! It.s the left and I.m thankful. (That sniper has started his play. I.d be a charge and a care. I.ll call it a regular break. Defenseless:  I revel their pluck. That.s funny! I caught myself humming. No wonder- I.m surely in luck. Some fellow more wounded than I.
I know (there he goes! He is aiming. I.ll pray and I hope that I can. The life of an ambulance man? To signal these searchers for me. The swine! One has stumbled:  he falters- he.s gone. And heaping of smoldering coal. (Wait! Someone is stealthily crawling. I hope he discovers my hole. Flop in. So your shoulder is wounded? ( I knew I could do it. He.s slipping. He.s falling. He fell to the ground. I felt I could silence that .zipping. To ones Uncle Sammy would test. They.re coming! They.re coming to find us. Why man- you.re the bearer he hit? Come here- slide around .til I see you. I thought he had finished you right. An ambulance man in the fight. Your armlet is noble to see. Then send someone over to me. 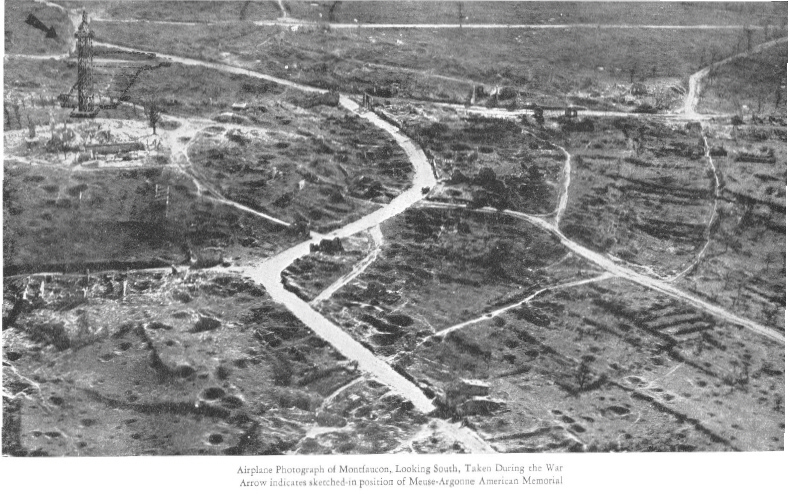 Image Caption: Airplane Photograph of Montfaucon, Looking South, Taken During the War. Arrow indicates sketched in position of Meuse-Argonne American Memorial. 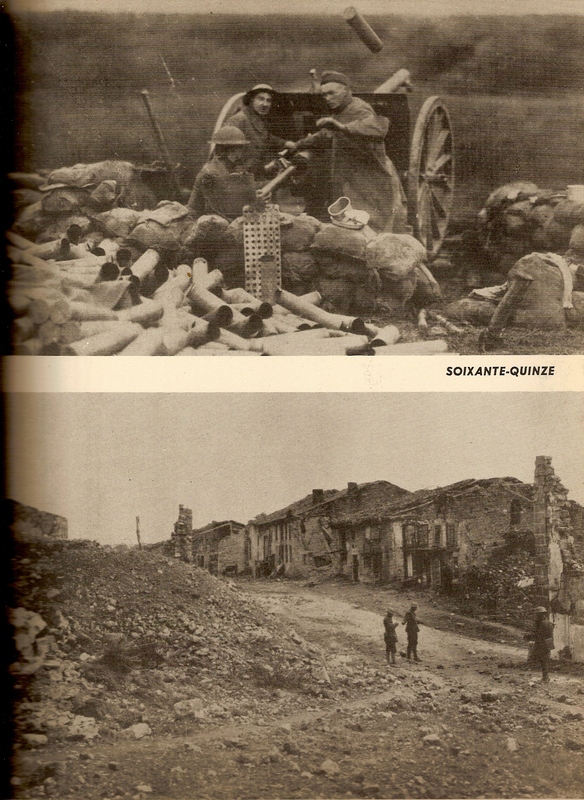 Many thanks to Mike Hanlon of the Great War Society for supplying photos and maps for this page. 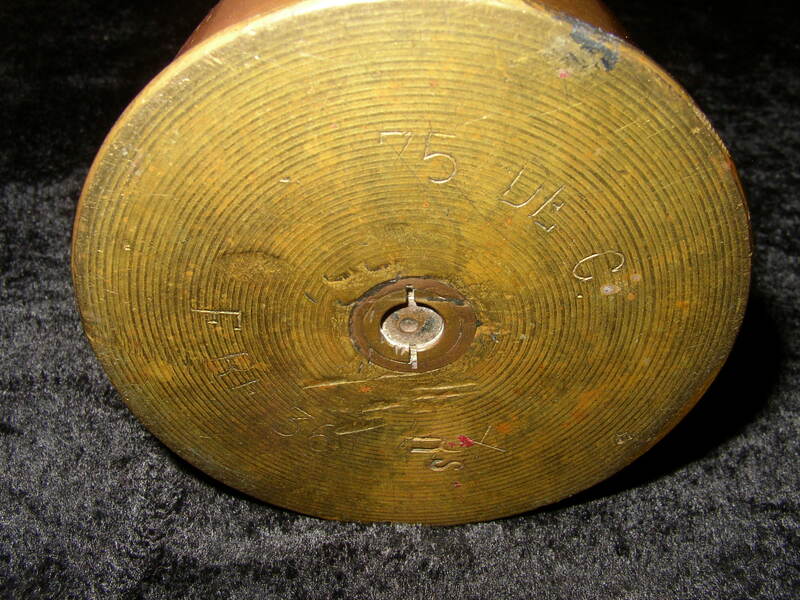 Trench Art 75mm Shell embossed with "Mt. Faucon"
This page is dedicated to Tony S. Patti by the Descendants and Friends of the 314th AEF for his unselfish work and time in seeing that the citizen soldiers of the 314th are not forgotten.